“Finca Los Congos is located in the town of San Fernando, Nueva Segovia. On the northern region of Nicaragua in close proximity to the Honduran border. Coffees from this region (as opposed to Matagalpa/Jinotega) have proved to be superior in the cup due to higher altitude in this part of Nicaragua. On the other side of the mountain, in Honduran soil, is the town of El Paraiso; this region is also producing some of the best coffee in Honduras. Rene Martin, the operator of the plantation, is not only a close business partner but also a friend of ours. His father, Jose Rene, the owner, planted about 32 hectares of Pacamara (70%) and Caturra in Los Congos. 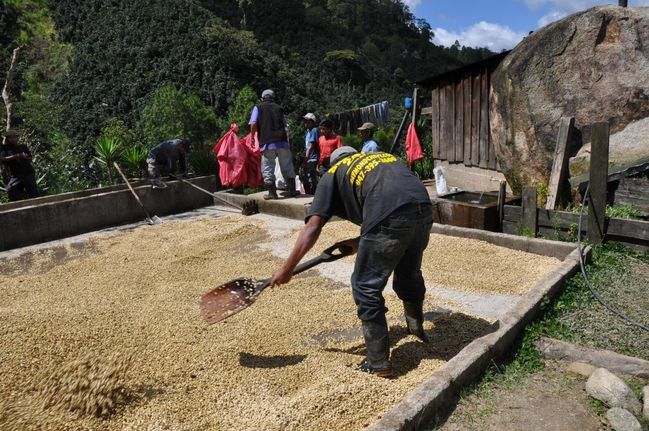 Why Pacamara? There really isn’t much Pacamara in Nicaragua and probably no other plantation with this big of production! A friend of Jose Rene suggested he use Pacamara due to its productivity and hardiness so he got seeds from El Salvador. Quills is proud to bring you the Pacamara variety of this coffee, and we have been incredibly pleased with it. You can enjoy it in several ways over the coming month. Try it on a pour-over, or take it home to brew manually yourself. You’ll pay a bit more, but it’s well worth it. Look for strong citric acidity with notes of tart cherry perfectly balanced with a chocolate/caramel sweetness and smooth body. Or enjoy it as the bright, punchy note at the front of our Blacksmith Espresso. We won’t be offering this coffee on batch brew. We just don’t feel like we can do it justice there!